by Raymond Stonehouse, his son. My father was one of these young boys. He was sent to a farm in Howick Quebec when he first arrived. He was very disappointed with the poor treatment and work conditions. He immediately returned to the hostel in Montreal where they placed him with another farm family which was more acceptable to him. He continued to work on a few farms and even ventured to travelling on box cars and ended up in Sudbury when he worked a while in the mines but eventually he returned to the Howick area farmer. (The RR Ness farm) When the war broke out he saw his way home by joining the Canadian army and was shipped to Great Britain in 1939. He married and had three children in England. After the war he returned to Canada followed by his wife and children and returned to work on the Ness farm in Howick as a hired hand and was supplied a house to live in and a weekly pay. The family grew to eight. George Stonehouse passed away in 1994. He wrote a diary of his life which is in my possession. 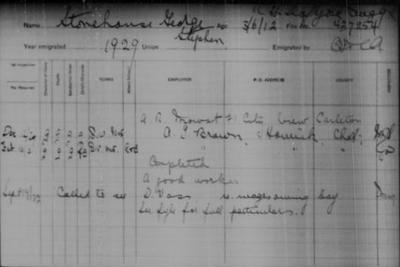 Two George Stonehouse "BICA Boys"
Raymond's George Stephen Stonehouse arrived in Canada on the "Duchess of York" in 1929 as the above Inspection Card indicates. There is another George Stonehouse who arrived in Canada in September 1927 on the SS Montrose. He had the misfortune of being one of two people murdered in London, Ontario in 1941 in a Beer House by a soldier with whom he had no previous acquaintance. Did George actually write in his diary that he enlisted in order to return to the Old Country? Join in and write your own page! It's easy to do. How? Simply click here to return to BICA Boys real stories.